Dava was born on Dantooine, in an overlooked City-province, not a major spaceport or destination, despite its beautiful ambiance. 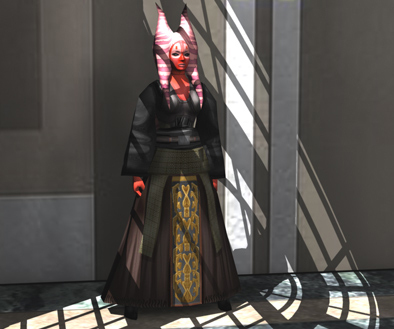 At the tender age of 3 Dava was uprooted from her home when her parents, who were political activists, moved to Coruscant to better voice their opinions to the New Republic Senate, and also participate in activist crimes. Spending a year on Coruscant within a low-income family was trying on Dava’s health, many times she was sick and without medicine. One day a Jedi Knight named Landru felt the Force guide him while traveling through the Coruscant slums. He was guided to an apartment building, and to the Eloras’ apartment. He felt the Force-sensitive Dava, and asked her parents if he could take her to be trained as a Jedi; they refused. A few days later Landru returned under the guise of night and stole Dava away, knowing that the life the Order could provide was much better than the one she would grow into if she remained with her parents.